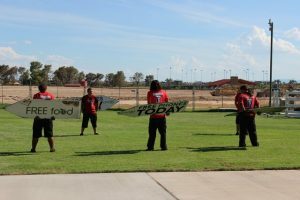 “We hate it when you call it sign twirlers,” says Caleb Jordan, who has worked in the industry six years and is the general manager for AArrow Advertising. Come blistering heat or pouring rain, the team is outside spinning, flipping, throwing, smiling, posing and waving for all the passers-by to see. Jordan says sign spinning has transformed from a creative way for businesses to get the word out to an international sport that draws inspiration from martial arts, dance and even video games. He adds the art form has attracted more than 1,000 participants worldwide, including the six who work for AArrow Advertising. “We are a family here,” he says. AArrow Advertising, Jordan says, is contracted out for about 100 hours each week throughout the valley. Spinners set up shop on street corners or in front of strip malls working four- to eight-hour shifts. Sign spinners from the company have also been used for conventions and even have been featured in movies. “There were sign spinners in ‘The Internship’ and ‘Dance Flick,’ ” Jordan says. 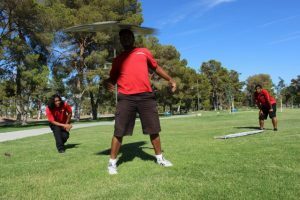 In addition to work, spinners meet up once a week at Craig Ranch Regional Park to practice and learn new tricks. Another Wednesday has arrived as the group migrates to a grassy field with signs in tow. They might look flimsy, but the few pounds the signs weigh is guaranteed to work the upper body, Jordan says. The sun blasts down as the six form a circle to commence another day of practice. “One, two, three, four, five,” says Rayen Jones as he takes the group through warm-ups and stretching. Then they begin exercises that involve the signs. Holding them behind their backs, the guys flip them up and down to help with wrist strength. “It doesn’t take too long to look like a pro,” Jordan says. Jordan was a sign holder for another company before he was approached to join the AArow team. He remembers his first day on the job — July 28, 2008. Things got easier after that first shift. Now, many of his moves — such as the boomerang in which he throws it and spins around — are second nature. “Sometimes, people think it’s a free show and give you tips,” Jordan says, pulling a $20 bill out of his wallet. Along with stretching Jordan prepares for another eight-hour shift by picking out his music for the day. “The type of music affects what kind of moves you do,” he says. For a recent shift, he used the soundtrack from “The Matrix” and music from E.S. Posthumus. 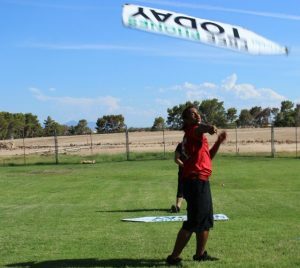 Jordan also has competed at the World Sign Spinning Championships, now held every February in Las Vegas. In 2013, he ranked fifth in the world. Although some spinners prepare routines for the event, Jordan just likes to get out there and feel the moment. Across the grass from Jordan, Jones is having a bit of fun with the sign as the team gets into the practice. He gives his sign a strong toss into the air, waits the two seconds for it to come down, then catches it and throws out a quick smile. Although there are no cars or customers around to see him, practice makes perfect. He also practices his favorite move, the helicopter, where he throws it up in a spinning motion and catches it with one hand. Before taking up spinning, Jones was a skateboarder. “I got tired of eating concrete,” he says. He adds that sign spinning has a lot of similarities to skating, just with less risk of injury. Every day, no matter if he is working or not, Jones wakes up, stretches and works on tricks — first using just his left hand, then just his right. As a result, people stop and notice his skills. He remembers one time when a woman was driving by with her child in the backseat. As they waited in traffic, she and her daughter watched and smiled. He is shocked when he gets compliments about his work. Although he loves the attention, it is not why he has chosen to work for AArrow Advertising. A yard or two away from Jordan so he doesn’t hit anyone, Mark Allen practices spinning — in front and then behind his back. In his two years, Allen has accumulated a variety of scars, scrapes and bruises from tricks that have gone awry. He points to a cut in the crease of his elbow from a time he caught the sign wrong. The summer heat can further complicate the day. No matter the skill level or the years of experience, each person at the Wednesday practice is there to learn and accept critiques on how to get better. Each spinner enters the circle and takes 60 seconds of freestyle spinning — anything from tossing the sign up in the air, doing a cartwheel and catching it to picking the sign up by rolling into a somersault onto it. During practice, Jordan also takes the group through other drills. One drill simulates a car pulling up. Jordan starts about 40 yards away and walks toward the team while they spin. Once he gets to a certain point, about 20 yards away, the spinners have to stop their tricks, point and smile. “Don’t be the last one to stop,” he says challenging their reflexes. Drenched in sweat, the team takes periodic breaks to grab water and juice to refuel. Each member holds his sign behind his back and joins in the group huddle as Jordan updates them. Then they end the session. Throwing one hand in — the other hand keeps the sign behind their back — the group ends their meeting with a chant.